You can't create an app workspace without first upgrading to Power BI Pro. Sorry! Click on Workspaces, and choose to create a new app workspace. Here I've called my app workspace Summary of all reports, and assigned two other people to use it (one as an administrator, one just as a workspace member). I've also made a couple of other choices - see immediately below for what these mean. Choose the option shown above to restrict the workspace to invited members. If you choose this option, other people will be able to make changes to the content of the workspace. Choose this option to edit a workspace. The third account listed was added automatically. 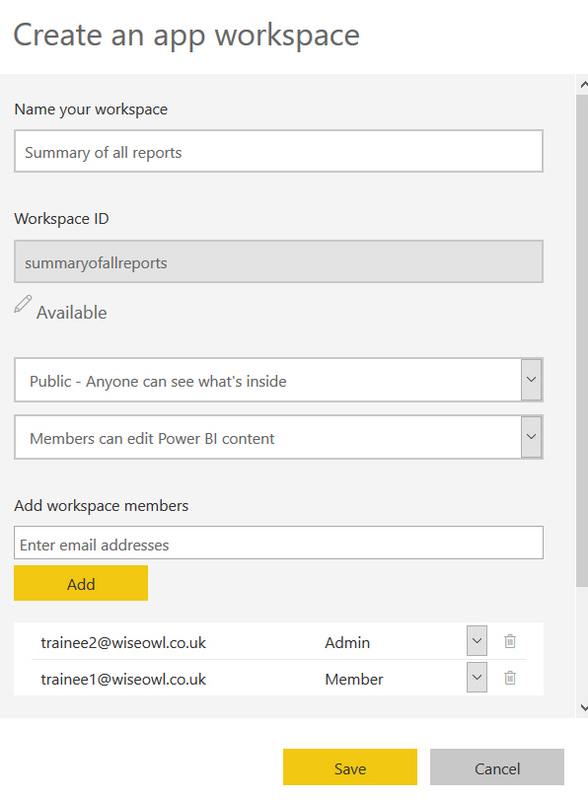 You can now add content to your app workspace, as shown in the next part of this blog.